Hi SweetP. I stopped playing AB Classic a long time ago, and even …gasp…removed the game from my tablet. So I can’t provide a screenshot, and obviously can’t explain my score from 5 years ago. 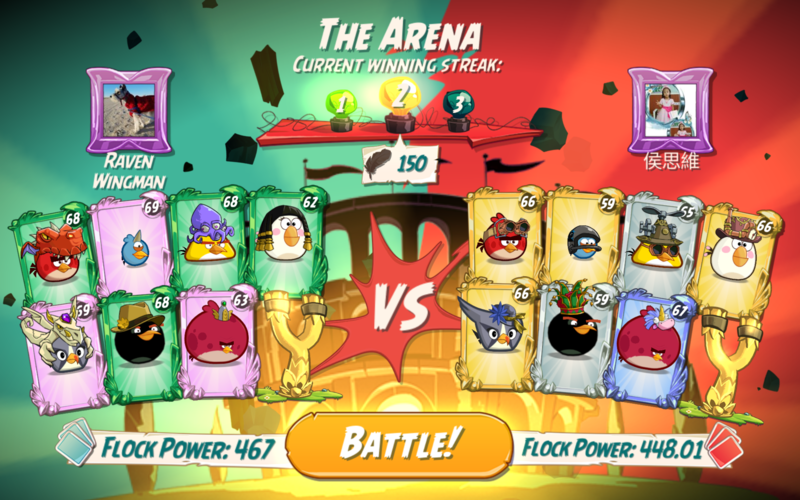 Match ups for levels 8-10 were for players with much higher Flock Power AND they all came in with 5 spells. Seems like another attempt by Rovio to drain Arena tickets and spells, causing us to use more gemstones, eventually spending more money. Anyone see a Flock Power with decimal points? Played normal, so I see nothing abnormal other than the decimals. Worked like a charm. Thanks @andalaybay! 1st bird similar to video, but aim straight up so that it’s highest point is above the light. Expand when it is where the horizontal and vertical supports meet, taking down the 1st and second lights. Got the lucky 2-birder, including a double Slam Dunk and taking out the rightmost pig. Really just lucky bounces, and a whole lot of flings. Swap Kanan Jarrus for a 1-shot solution. Aim Kanan for leftmost stack and tap on rightmost stack. Kanan takes our bottom of each stack causing all the blocks to come tumbling down. Best score with this was 174,260. Came back trying to improve my score and just kept flinging the high lob. Finally got Red and two basketballs through the hoop, with most blocks breaking. Still some more points available.